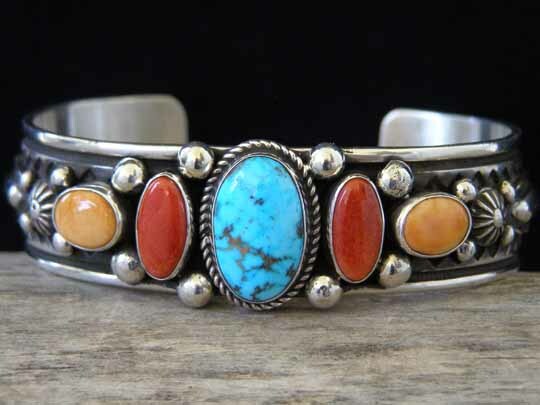 Albert Jake Morenci Turquoise, Mediterranean Red Coral & Orange Spiny Oyster Row Bracelet size 6 5/8"
This colorful graduated row bracelet is set with a center oval of natural, untreated Morenci turquoise from Arizona flanked by ovals of Mediterranean red coral and orange spiny oyster. Raindrops and starred buttons complement the stone, coral and shell settings while traditional stampwork decorates this uniform-width cuff to the terminals. Morenci turquoise: 11/16" x 7/16"
Red coral: 2 ovals 1/2" x 1/4"
Orange spiny oyster: 2 ovals 3/8" x 1/4"